The deep and dark gnarled roots of Halloween, All Hallows Eve, go back to the Samhain celebrations of the Druids. Samhain is one of the Celtic fire festival where much chaos, mischief and celebration take place. It is the end of the harvest and a time to prepare for the new year. Sacred bonfires are lit to celebrate the darkness of the yet to be born new year. Since the veils between the worlds are at their thinnest, it is an auspicious time to communicate with the spirits of those who have passed over. Beginning at sunset on October 31st fires are kindled anew for the coming of the dark. Rituals of purification abound, in order to clear away what no longer serves and make room for what is to come. I've created a room/body spray to celebrate Samhain and greet the New year. Like the fire holiday the fragrance is warm, spicy and tinged with smoky, golden embers. I call this new creation the Phoenix Myster. 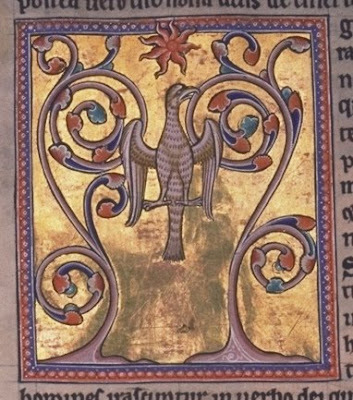 When the time of transformation arrives for the mythical phoenix he builds his next of twigs of myrrh and then lights up in flame. Burning away all that no longer serves, from the dark ashes an egg manifests which will birth the newly reborn Phoenix. Purged of the old, a spirit is born, fresh and ready for the new phase. 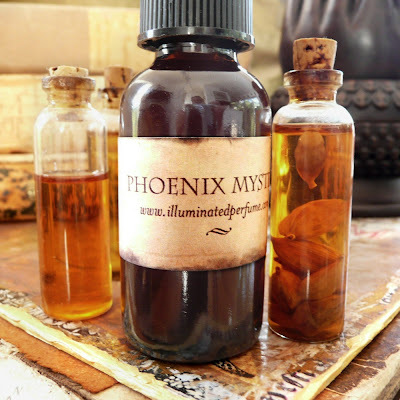 The essences contained in the Phoenix Myster include Vanilla, Benzoin, Myrrh for the nest, a spice accord I created termed Garam Masala, Orange and the embers of smoldering ashes. I also included the Dragons Blood resin I picked up at the indigenous native village while in the Ecuadorian Amazon. The formulation also contains tinctured egg shells from last Samhain. 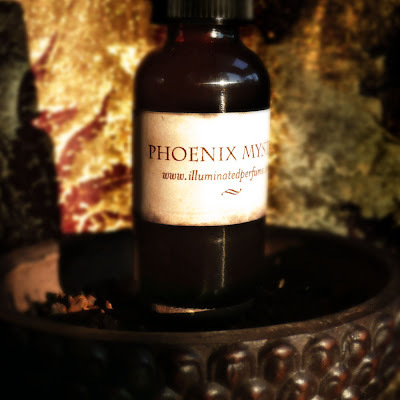 Warming like a cup of spice tea, the Phoenix Myster, is exhilarating and uplifting. The muse for this fragrance is Tom of the perfume blog Perfume Smellin' Things. Years ago I was contacted by e-mail and asked if I created room sprays. I answered saying that one was in development but was not yet ready. The e-mail was from Tom and the fragrance in development was the Phoenix Myster. Thank you Tom for your wit, your way with words and the support you give to the niche perfumers of the world. Phoenix Myster comes in a one ounce amber glass bottle with fine mist sprayer with waterproof label available at my Etsy shop. Here are the details from the listing, some of it is repetitive. A natural perfume aromatic spray for the home and body. The Phoenix Myster is a fine spray mister for your home and or body. We use ours to naturally scent the room, our sheets, pillows, curtains and our selves. created specifically for All Hallow Eve, also known as Samhain. The warm, spicy, invigorating aroma has been weaved like a complex perfume. Dragons Blood Resin from a small indigenous village in the Amazon. and oleoresins in my aromatic preparations as well as properties of magic. I also create my own accords, infusions and tinctures. and renewel. Like the phoenix, we build our nest of myrrh and consciously step into transformation to be birthed anew.